We’ve previously added video profiles in mobile and run them daily with eideticker. Here’s a proof a concept for doing the same thing for tracking page load on desktop. This works by tagging frames and CPU samples with a frame number. During the analysis we use this information to correlate the video stream with the CPU samples. This lets us take something like a page load, slow it down and watch what we’re executing at each frame. Seek to 4 seconds where the page is requested. This will continue to 5.5 seconds. During this we see a little network activity and a bit of work compositing to update the throbber. This is no surprise since my WiFi signal was poor. Seek to 5.5 seconds where the page starts to appear on screen. Lets look closer at the first frame in order. 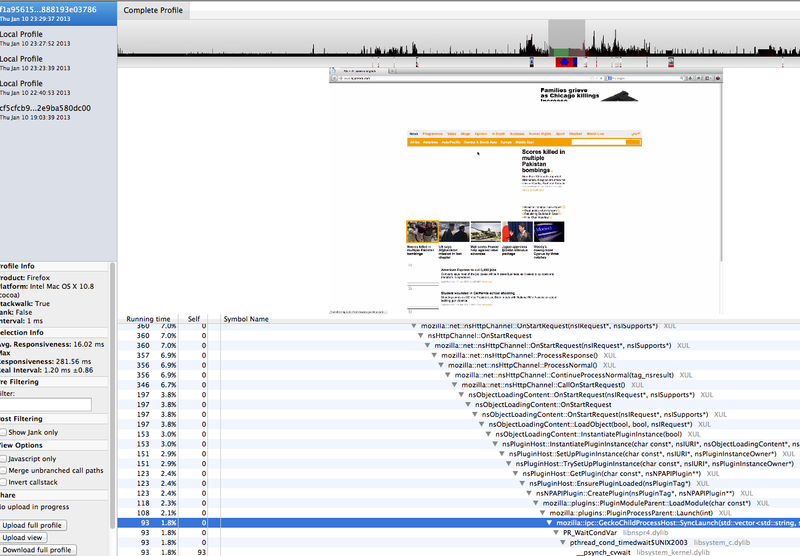 37 ms reflowing the page, 16 ms of which is doing main thread IO loading fonts when calling ‘CGFontCreateWithFontName’. Seek to 5.9 seconds where we are waiting on the plugin to load. The plugin takes 200ms to load. This means we miss several frames. Seek to about 7.3 seconds. During this frame the plugin stream is created. This adds another 100 ms delay. My goal is to start making video capture features into the profiler add-on to make these profiles easier to capture.